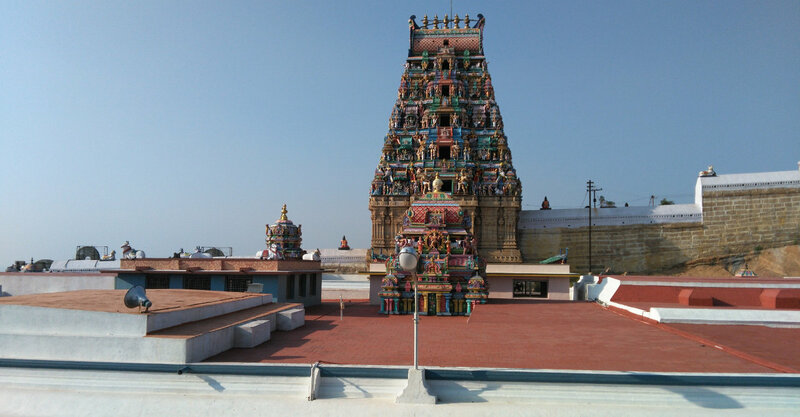 Sri Magudeswarar Temple at Thiruppandi Kodumudi (Kodumudi). 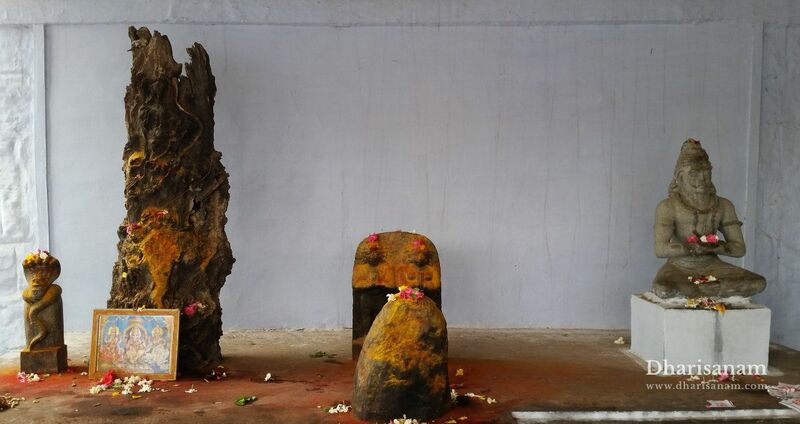 This is one of the 276 Thevara Paadal Petra Sthalams and 6th Shiva Sthalam in Kongu Nadu. This is a famous Sthalam for performing rituals to satiate one’s ancestors. This is also a Parikara Sthalam for Naga Dhosham. The temple is situated on the banks of the river Kaveri. There are three adjacent temples inside the same premises for Lords Shiva, Vishnu and Brahma. All the three towers are east facing. The temple has epigraphs from the time period of King Sundarapandiyan Kesari’s rule. It is believed that the pieces came down as 5 different gem stones – Red Corel at Thiruvannamalai, Ruby (Manickam) at Rathinagiri (Thiruvatpokki), Emerald (Maragatham) at Engoimalai, Sapphire (Neelam) at Pothigaimalai and Diamond at Kodumudi. As per legend the Diamond that feel at Kodumudi became the Swayambulingam (self-manifested lingam) and the rest of the stones became hills. Since the origin of the lingam is from the Meru, the lord is called Magudeswarar. It is also believed that Sage Agasthiyar installed and worshiped the idol of Lord Shiva and his finger prints can be seen on the deity. It is also believed that Kodumudi is the place where Lord Shiva performed a dance for Sage Bharadwajar. It is also said that both these sages were blessed with Lord Shiva’s wedding darshan here. Thiruchengode is 20 kms from Erode and 35 kms from Namakkal. Nearest airports are at Coimbatore and Trichy both are at a distance of about 130 kms. Nearest major railway station is at Erode. 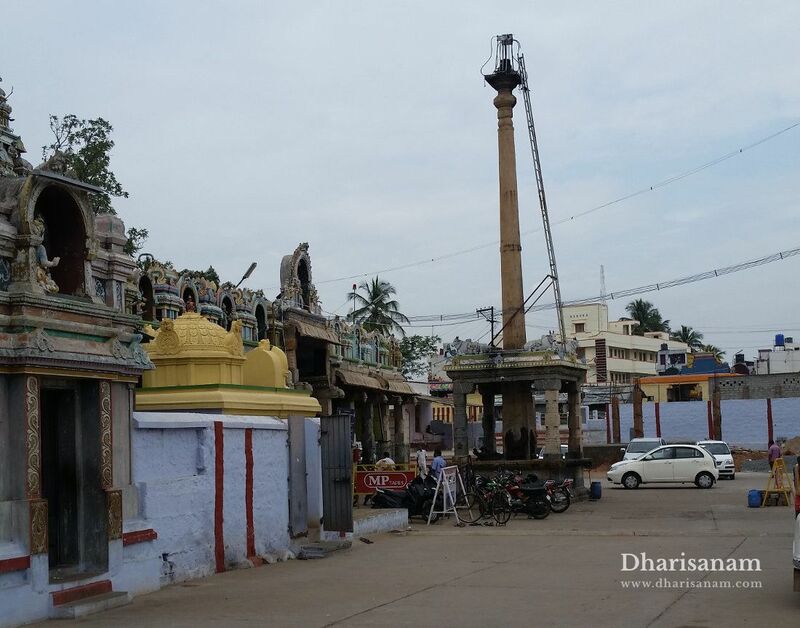 This is one of the 276 Devara Paadal Petra Shiva Sthalams and 4th Shiva Sthalam in Kongu Nadu. Moolavar is Swayambhumurthy (self-manifested) constituted of Nava Bashanam. This temple is located at the top of a hill, at a height of about 1900 feet and there are about 1200 steps to reach the top. You can either choose to climb the stairs or take the motorable road. Vehicles are going right up to the entrance of the temple. The moolavar sannathi is facing the west. Lord Mahavishnu and Adiseshan are believed to have worshiped this Moolavar. This is an ancient temple and according to the inscriptions on the walls it must have been built about 2000 years ago. The hill, that this temple is on top of, is mainly composed of sand stone and is reddish (senniram) in colour. This is why the place is called Sencode. Another reason for the name Sencode could be that the hill is a straight formation (Senguthana malai). Other names of this hill are Nagagiri (nagam meaning snake and giri meaning malai) and Vayumalai (wind). As per mythology, Adisheshan (the serpent on whom Sri Mahavishnu rests) and Vayu (lord of the winds) fought among themselves frequently to test their superiority. During one such struggle, against Vayu’s severe wind, Adhiseshan failed to hold on to the Mount Meru. Three portions of Meru Malai came down to earth with Adisheshan’s blood strain. One such piece is this hill. Since it was believed to be red in colour due to Adisheshan’s blood strain, it is also called as sencode. An interesting fact is that this hill itself is considered as the Lingam. In front of this hill, on the west side is the statue of a large Nandhi – seven feet in length and four feet in height. 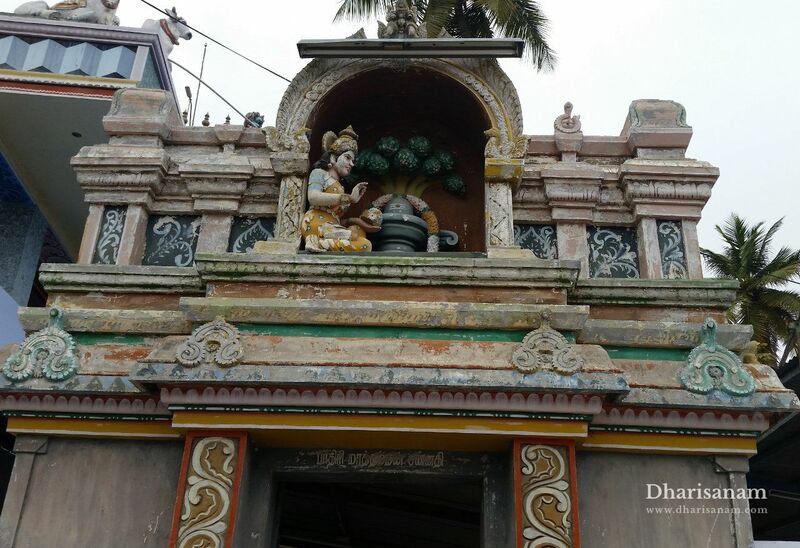 The distinctive feature of this temple is that the idol of the main deity is six feet in height with the right half depicted as male and the left half as female. The male portion of the idol has jadamudi (knot of hair), thandam (baton), Silambu (anklet) and Rudraksham mala whereas the female portion has a Kazhal at the leg and Thali around the neck. Due to the androgynous nature of the idol, the deity is known as Arthanareeswarar. 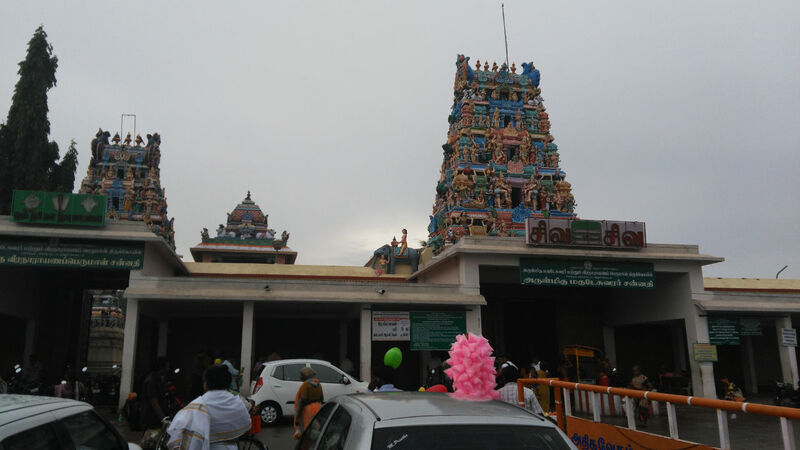 Sri Avinasiappar Temple, Tirupukkoliyur (Avinashi). About 40 kms from Coimbatore and 10 kms from Tiruppur. Nearest airport is at Coimbatore. Nearest Railway station is at Tiruppur. This is one of the 276 Devara Paadal Petra Shiva Sthalams and 1st Shiva Sthalam in Kongu Nadu. The Moolavar is Swayambumurthy (self-manifested). Vinasam in Sanskrit and Tamil means perishable. Avinashi means imperishable (eternal). 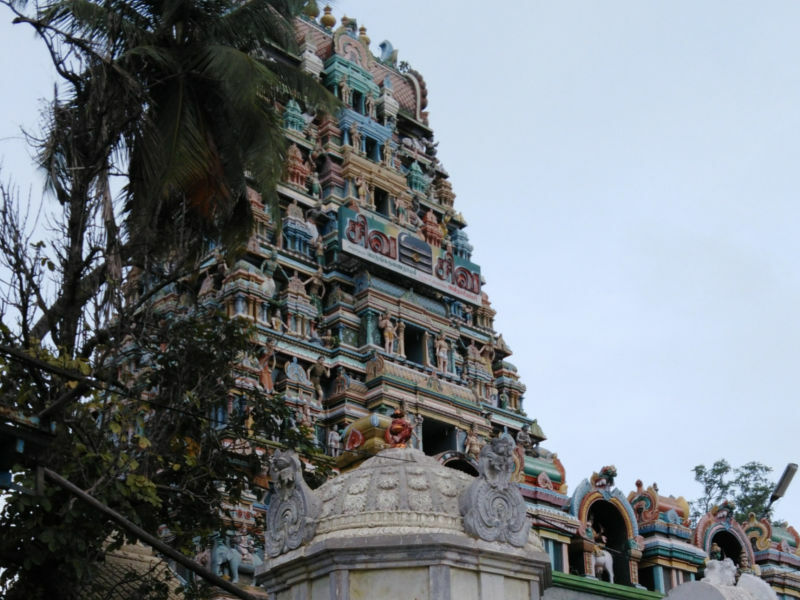 The colloquial name of this temple is Karunaiyaathaal Temple. Avinashi is referred to as Dakshin Kashi (South Varanasi). The historical name of the place is Tirupukkoliyur. Thiru meaning grace of God and Pukkoliyur meaning a place of refuge. It is said that once Devas took shelter in this temple in fear of Asuras. The main tower (Rajagopuram) is 7-tiered and is more than 100 feet in height. The temple is a protected monument under the Archaeological survey of India. The temple belongs to 10th century CE. The present structure of the temple was originally built by the Kings of Chola, Hoysala and the Mysore dynasties. The main tower was first built during the period of King Sundarapandian and later reconstructed by the King of Mysore. The Lord Avinashilingeswarar enshrined in this temple is believed to be an offshoot of the one in Kashi (Varanarasi). For this reason, Avinashi is also known as Dakshin Kashi. As per the Tamil saying “Kasiyil Vasi Avinashi”, it is believed that devotees looking to seek the blessings of Lord Shiva in Kasi-Varanasi, can do so by worshipping Lord Avinashilingeswarar in Avinashi. The Theertham (holy water) in the “Kashi Kinaru” and the idols of Lord Avinashilingeswarar and Lord Bhairavar are said to have been brought from Kashi. Bathing in the Kashi well in this temple on new moon day (Amavasya) is considered to be auspicious. It is said that the temple has a close relationship with the Mysore Royal family. In the early days, it was customary for the king-designate to go to Kashi, bring a Lingam from there and perform poojas in this temple before assuming power and stately responsibilities. 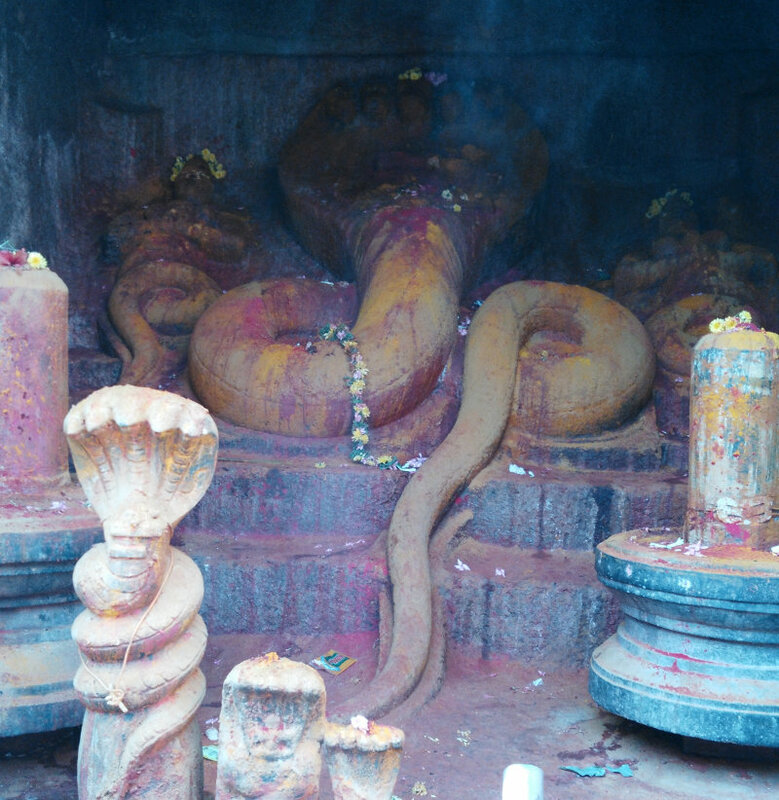 The legend is that Goddess Karunambikai did her penance and worshipped the lingam under the Pathiri Tree here. The Pathiri tree of this temple would blossom only during the Brahmmotsavam festival and not during other days of the year. 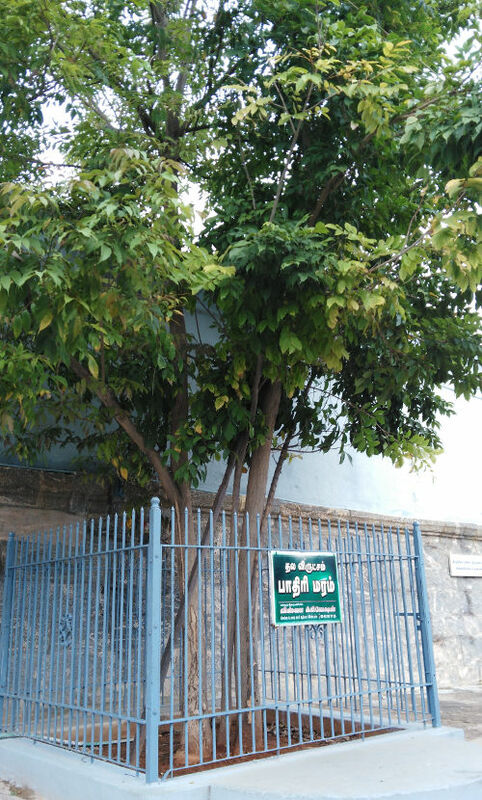 According to this temple Sthala Puranam, this shows the devotion of the tree to Lord Shiva. According to scriptures, it is said Sage Vasishta worshipped in this temple to seek respite from the adverse effects of Sani Bhagwan (Planet Saturn). It is believed that he installed an idol of Sani Bhagwan in this temple. This idol is now worshiped as Anugraha Murthy. The lord of this temple is also known as Brahmapureeswarar because it is believed that Lord Brahma worshipped here to seek atonement for his sin. Lord Ram, Iravath (Lord Indran’s white elephant), Thadagai and Naga Kannigai are also believed to have worshipped Lord Shiva here.